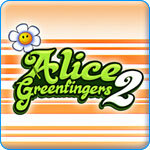 Alice Greenfingers 2 Game Review - Download and Play Free Version! Alice Greenfingers is back with her green thumb and this time she's working to save her lazy Uncle Berry's farm. Grab your seeds, shovel, and watering can and master the processes needed to run a farm. Meet each of Berry's goals to complete each level. Unlike other management games, Alice Greenfingers 2 is not timed so it is pretty much impossible to miss or "die" on a level. You can pretty much take the game at your own pace. Alice Greenfingers 2 is rather unique as a time management style game since it has many of the elements found in such games, but does not restrict you by setting a certain time limit. Thus, the slower you go the more points you can get, but getting the highest score isn't really the ultimate goal. With the completion of each goal, you will get a free upgrade to your farm, such as a bigger market stall, more popularity, or a hen house, all of which make reaching that next goal even easier. You can rearrange your garden whenever you want, and there is no need to worry about running out of cash since you get a free $2 every time you pick up the apples that fall conveniently from preplanted tress. With low maintenance crops and no ticking clock, Alice Greenfingers 2 is all about having fun and enjoying the gameplay at your leisure. A nice feature, for those whose real lives create lots of interruptions, is the ability to save at any time. While fans of other management games might find Alice Greenfingers 2 a little peculiar at first, with only a little play time they can find the charm of this unique game start to grow on them. So, try a change of pace and learn how to relax with Alice Greenfingers 2 today! Alice Greenfingers 2 is a task management game that places you in control of Alice as she works to save her lazy uncle's decayed farm. You'll be able to grow up to thirteen different crops as you progress through your game and upgrade your farm. You'll need to seed, water, harvest, and sell these plants at the market to rake in the big bucks. At the end of each day, you'll be able to purchase new upgrades, items, or animals to help you rake in even more money. There are other ways to make money as well, such as collecting fruit from trees or selling items produced by your animals (honey, milk, etc.). This game is fairly simple and easy, incredibly addicting, and lets you play at your own pace. 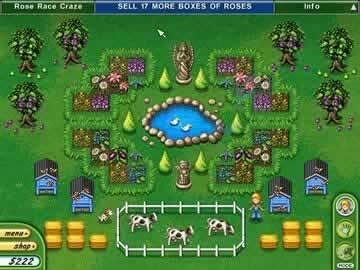 Like many other similar games, the gameplay in Alice Greenfingers 2 is fairly simple and straightforward. Each day, you'll be given a goal to reach. This goal, and your progress towards this goal, will be clearly indicated on the screen. However, there's is no time limit or rush of any kind to complete the goals, so you can do them at whatever pace you wish. You can complete them as fast as possible, or put them off to earn more money. The goals you are given range widely from planting certain plants to making a certain amount of money or selling certain types of crops. Once you have completed the goal, the day ends and you advance to the next day and a new goal. You also have the ability to choose new upgrades, items, or animals for your farm at the end of each day. 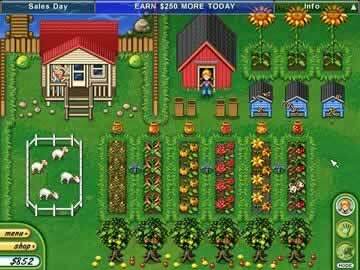 You can expand your farm to grow more crops, buy animals that produce products you can sell, buy decorations, and a good deal more that let you customize your farm and give you more ways to make money. One possible drawback of the game is the level of difficulty. You are able to play at your own pace in this game, and none of the goals you need to meet are very challenging. This makes the game a great choice for newer players or anyone looking for a more relaxing task management experience, but also means that more experienced and skilled players won't find much of a challenge to keep them engaged. More difficulty options and the ability to take on tougher goals would have been a great addition to this game. The basic controls and gameplay of Alice Greenfingers 2 are simple and introduced to you as you first begin the game. The first few days take you through simply interacting with items, digging up soil to plant, seeding the soil, watering plants, harvesting, and anything else you need to know. This game is simple enough for anyone to learn very quickly and begin building up and improving their farm. You need only the mouse and a hefty amount of clicking to perform actions in the game. Overall, Alice Greenfingers 2 is an excellent game for almost anyone, especially those looking for a great task management game to keep them playing for hours on end. The lack of a challenge or repetitive nature may put off a few players, but there's plenty of positive features that more than outweigh the negatives. The ability to organize and decorate your farm as you see fit is an excellent feature that puts you in control. You are constantly unlocking new upgrades and items to further improve your farm and earn more money. There are a variety of crops you can grow and sell, as well as several other ways to turn a profit. With no time limits, you can play at your own pace and how you want. This game is definitely one that's well worth playing. View various gameplay aspects such as harvesting crops, going to the market, and upgrading your farm.